that comes with over 100 stitch options, is computerized and even comes with an instructional DVD that teaches you how to get you up and running quickly. 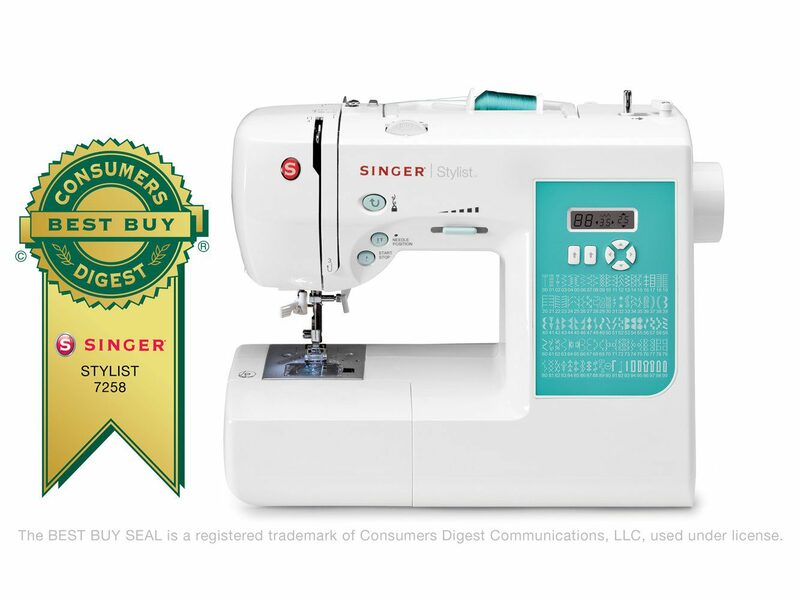 With 10 different presser feet, a metal frame and a variety of stitch options, the Singer Stylist 7258 is the perfect machine for users of all experience levels. It’s midrange price is perfect for anyone trying to pick up sewing as a new hobby, or someone that needs a more advanced machine for their sewing needs. Before we dive right into our Singer 7258 review, let’s first look at this sewing machine’s features and specifications at a glance. This will allow you to know what this model has to offer right up front before we go into more detail with each feature that this model offers. The 7258 makes sewing garments a breeze. Like the Singer One Plus, this model has won the Consumers Digest Award twice, so you know it’s a great solution. Let’s first start by talking about all of the stitch options before going into some of the setup and refinement options. Stitches are easily chosen using the LED display. This is a simple, non-colored display that is really simple to use. What I really like about this model is that all of the stitches are on a diagram on the right side of the machine. Directly above the diagram is the LED control where you’ll select your stitches. Now, you won’t be scrolling through dozens of stitches like with other Singer models. Instead, you’ll simply choose a number that corresponds with the stitch that you would like to use. Right underneath each stitch on the diagram is a number. You simply move the number on the LED screen up or down to select your desired stitch. I won’t lie, this is a little tedious if you have to get to stitch 50 and scroll through 50 numbers, but it’s not too much of an issue considering other models make you scroll through every stitch. 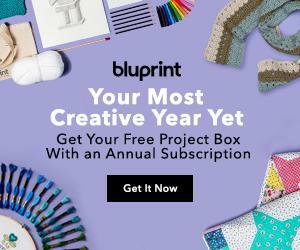 So, you now have every stitch you need to start your next project. You’ll also be pleased to know that the buttonholes are automatic, and you have seven different options to choose from. 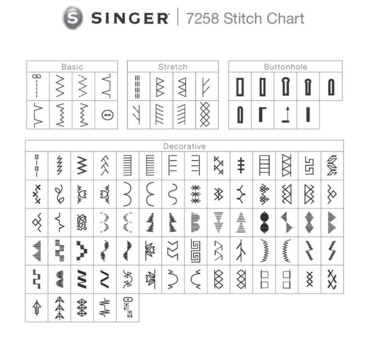 The Singer 7258 creates perfect-sized buttonholes each and every time. 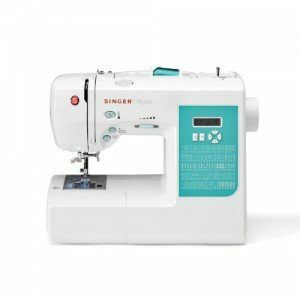 There are so many stitch and needle options available with this model that it really makes the Singer Stylist 7258 one of my favorite sewing machines on the market. This allows you to make a long stitch for decorative projects or tighter stitches for thicker fabric to ensure that the stitches will hold up to more rugged uses. But this isn’t even most impressive option. If you’ve ever quilted before without an advanced machine, you know that it’s difficult to adjust the stitch position when the needle is up. What normally happens is that you’ll try to rotate your pattern, but your stitch will be slightly misaligned as a result. On the left of the machine is a button that allows you to program the needle position. Essentially, you’ll be able to decide what position the needle lands on when your foot is released from the pedal. If you want to turn the fabric, simply press the button and release your foot from the pedal and the needle will land in the downward position. This allows you to have your needle in place to rotate your pattern, so stitches are always perfectly aligned. This is an advanced feature that is super handy and ideal for quilting and decorative projects. These are small features that really make a difference when sewing. I was shocked to also see that you can use this function without using the foot pedal at all. There are speed options that are can be chosen right on the front of the machine that allow for automatic sewing without a pedal. You’re still in control of guiding the needle through the pattern, but you don’t need to actually use your foot to control the speed. And you can adjust the speed mid-stitch by simply moving the slider to the left or right. You’ll also find a convenient LED light illuminates your workspace, allowing you to see what you are working on with ease. To save time and frustration, there is an automatic needle threader with a top loading bobbin. The bobbin’s cover is clear, so you can tell when you need to change the thread. Threading a needle has never been easier, and the company also includes an automatic reverse and pressure foot option. If this wasn’t enough, you also get 10 different presser feet included with your purchase. I almost forgot to mention that this model has a free arm which also has a nifty storage compartment to store your extra needles if you need. The Singer Stylist 7258 is a little noisy when in operation, but this isn’t much of an issue when sewing. I found this model to be extremely durable thanks to the unit’s metal frame, and I also found that I was able to do everything from quilting to sewing pants with ease. With the included DVD, I wasn’t overwhelmed with all of the options to choose from, but I do want to note that the DVD is not model specific. It goes through some of the basic features that less advanced users would need to know. Having the ability to choose your stitch length, stitch type and even the needle position puts this model at the top of its class in this price range. I couldn’t recommend this model more for beginner and intermediate users – even advanced users will find a lot to love with this model. Is there the option to use a foot pedal if you so choose? I know Singer sells foot pedals that fit multiple models.